Click the links above to quickly navigate to more information about this product below! Feel free to call us at 1-888-736-5094 if you have any questions! 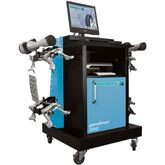 The Hofmann Geoliner 550 features the next generation of imaging alignment technology patented by Snap-on Equipment. The Geoliner 550 Alignment System uses high-definition cameras encased in heavy-duty magnesium pods that mount to the rear wheels. A set of non-electronic, shatter-proof imaging targets are mounted to the front wheels to complete the system. Measuring information collected by the imaging system is transferred via Bluetooth™ wireless technology to a Windows-based computer console. Below you will find much more information about this product, including all of the INCLUDED features that set this product above the rest: Details on the Imaging Unit, Computer, & all other Featured Components; a full list of Specifications; a Photo Gallery with more pictures of this product; Shipping Information; & Optional Accessories available! See Below For More Info! *Info on other specs included with the computer can be found under the components section above. If you cannot view these files, you can download Adobe Reader for free! Click the icon to the right, or click here to visit Adobe's web site and start your download. Adobe Reader is a common format used on many web sites on the internet and is a very useful tool outside of Complete Hydraulic's web site as well!